Denmark continues to set the pace in driving down the cost of offshore wind. In its latest tender for 350 MW of near-shore wind farms the maximum price has again been reduced. Danish offshore wind now costs roughly half of what the new nuclear plant at Hinkley in the UK will cost. Denmark has launched a new tender round for 350MW of near-shore wind farms off the east coast of Jutland i.e. the Kattegat and its environs. This area has a number of features which favour low-cost offshore wind, for example relatively shallow waters, roughly 20 metres deep for 20km out from the coast, which in turn implies low-cost farm-to-shore power connections, plus a very favourable wind regime. In the previous round of tenders for Horns Rev 3 (400MW), located off the west coast of Jutland in the North Sea, the bid price was €103/MWh. This was a considerable reduction on the price (€140/MWh) offered for Anholt (400MW in the Kattegat). Levelised costs for these projects are difficult to estimate since once the ten years are finished the farm can only sell its power onto wholesale markets. I estimate that For Horns Rev 3 the LCOE (Levelised Cost of Electricity) based on a wholesale price of €35/MWh is likely to be around €74/MWh. In previous articles on this subject, I speculated that the next tender round could well be priced at around €93/MWh which would reduce LCOEs further. As it turns out, this was either a) a lucky guess or b) the Danish energy regulator read the article and decided on a price of one € more at €94/MWh (actually 0.07 Danish Kroner/kWh – roughly €94/MWh at 7.45 Danish kroner per €). This is the maximum price for bids. This means that the final price offer could be lower. The price covers the first 50,000 full load hours from the farms, which depending on capacity factors will cover something in the range 8 to 11 years of wind farm operations. After that, farm revenue depends on the vagaries of the NordPool market. Another condition which sets it apart from other Contract for Differences (CfD) implemented in other countries (e.g. the UK) is that the €93 is not index linked (i.e. inflation-adjusted). Other conditions worthy of note in this tender include the sale of 20% of the project to local residents at cost. The Danes (and Germans) take the idea of local ownership of generation seriously. The large number of energy co-ops in both countries bears witness to this. The regulator has included conditions, which will prevent financial engineering that could either dilute or weaken the participation of locals. For example, all shares will have the same ranking as others and there is no possibility of forced sale to other shareholders. The tender also specifies that large wind turbines must be used in the range of 7 to 10 MW. Such turbines are likely to have higher capacity factors not least due to their height. Taking a capacity factor of 60%, a discount rate of 5% and a wholesale rate of €35 gives a net present value (NPV) of €500m on a project with an investment of roughly €1000m (assuming a MW price of around €3m). The NPV represents total revenues minus costs over the entire period with a discount rate, i.e. the profit the project makes. The internal rate of return (IRR) comes out at 12%. The above figures are over 28 years. Cost of a MWh over this period (and based on the above) is €68. Factors that could affect this include the capacity factor (a higher capacity factor will mean more energy and thus a lower overall price/MWh) and the wholesale price. The above pricing and conditions sit in stark contrast to events in the UK and the proposed nuclear station at Hinkley. The table below summarises the main points. It is clear is that the Danes have a firm grip on prices, costs and a determination to get maximum value for money for their citizens. By contrast, on the other side of the North Sea, in the UK, the current Tory government dishes out austerity for UK subjects and what could be characterized as large doses of charity for non-UK companies such as EDF. This in a country with the best resources for on and offshore wind, in Europe. Proponents of the Hinkley project could argue that the current Danish tender is very small (at 350MW) compared to Hinkley (at 3200MW) and thus one is not comparing like-with-like. 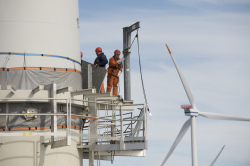 However, the Danes plan to install around 3000MW of offshore and near shore wind by 2020. Thus, whilst an individual project may be small, the overall programme is comparable in size/scale with Hinkley and other proposed nuclear stations. Mike Parr is Director of energy consultancy PWR which undertakes research in the area of climate change and renewables for clients which include a G7 country and global corporations. 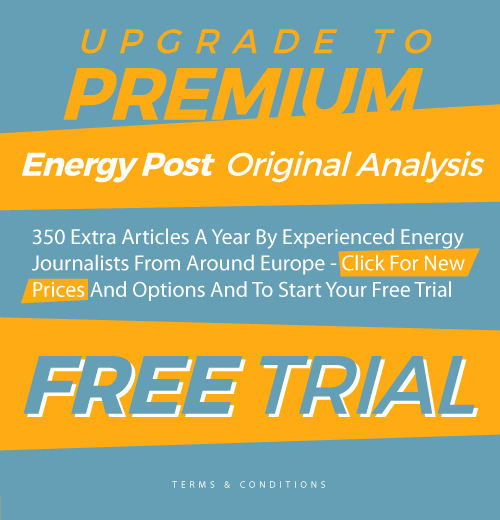 See here for his previous articles on Energy Post. Note that compared to his previous article on the cost of offshore wind in Denmark, the author has re-assessed the wholesale price upwards from €25/MWh to €35, given that a new connection will be built between UK and Norway, which will impact NordPool prices. Hence there is a difference between the LCOE for Horns Rev 3 in this article and “lifetime” costs for Horns Rev in the previous article. The author has also made a more conservative assumption for the capacity factor of the Saeby wind farm, which he has adjusted from 65% to 60%. Discount rates for these kind of projects are not 5% but at least 8-10%. Your assumptions lead to an underestimation of your LCOE levels by at least 30€/MWh. The other articles I have written contain links to data published by the Danish regulator for each wind turbine on & off shore. The data is both per year and per month. Horns Rev 2 has several years worth of data – capacity factors are in the range 48 to 51%. These CFs correspond to, for example CFs from other farms such as Alpha Ventus in the German sector of the North Sea – close to HR 2. These factors are specific to that area of the North Sea. It is quite possible that CFs for off-shore in other location may be different. Discount rates – are based on bonds raised by Vattenfall, Dong etc to finance such projects (there are various web sites which give global coverage on corporate and gov bonds). The 5% is probably an overestimate given current interest rates of 0.5%? & nope I have not underestimated by your figure – mainly because I have used real data specific to that area. Furthermore, the newest 7/8MW WTs have yet to be deployed – I would thus expect CFs to be higher and LCOEs lower. It’s worth bearing in mind that wind differs from most other generation technologies in that lifetime capacity factor is a design decision (plus or minus a smaller contribution to variation from weather variations), reached by trading off costs of blades, electrics, and grid connection. Any wind site could be 1% capacity factor, or 80%, or anywhere in between, driven by the choice of turbine components. Either extreme would indicate a failure of profit optimisation. is a less mature sector than onshore, and there’s still a lot of learning to do. And because the Danes tender on a basis of price per MWh, an incorrect forecast of capacity factor doesn’t change the cost to the Danish customer; instead, it impacts the developer’s bottom line. Additionally, the discount rate will depend very much on the bidder: there are several potential bidders who have access to very cheap finance. My thanks to Csaba Urbaniczky for the inbound link.